You can pay $143 in cash, $125 in cash and 24,000 HHonors points (getting 0.075 cents per redeemed HHonors point), or 60,000 HHonors points (redeeming your HHonors points for 0.24 cents each). Another way of putting the same facts is that you can pay 60,000 HHonors points, or 24,000 HHonors points and $125 in cash (buying 36,000 HHonors points for 0.35 cents each), or $143 (buying 60,000 HHonors points for 0.24 cents each). In other words, a cash and points redemption can be thought of as buying HHonors points with the savings compared to a cash rate, or redeeming HHonors points to save money off the cash rate. As I say, that's a curiosity built into the concept of points and cash redemptions, and I'm not going to resolve it one way or another for you today (or ever). I'm interested in something else. I'll dispense with the comparison to a cash rate (around $1,622 for two passengers) and focus on the top and bottom redemption options. It's possible to redeem 40,000 Avios and pay $178.18 in taxes and fees, or 14,000 Avios (26,000 fewer) and $498.18 ($320 more). 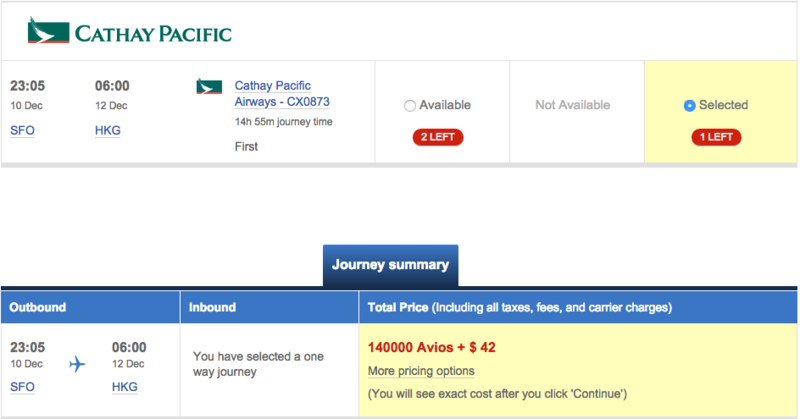 If I already had 40,000 Avios in my account, this would be a no-brainer: I'd redeem the miles I earned. But as you can see, I have between 20,000 and 26,000 Avios in my account currently (a hair over 24,000, in fact). That means I can transfer 16,000 Ultimate Rewards points to British Airways in order to save $240 (getting 1.5 cents per transferred Ultimate Rewards point), or I can redeem 6,000 fewer Avios and pay $80 more in cash (buying Avios for 1.3 cents per point). The problem is that those are both outstanding opportunities! 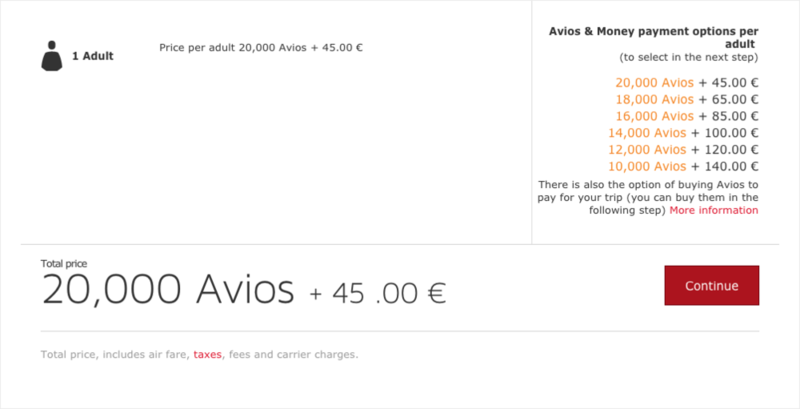 Buying Avios for 1.3 cents each is a great discount if I have any plans to redeem the saved Avios for short-haul American Airlines flights, which can offer phenomenal value. Redeeming Ultimate Rewards points for 1.5 cents each is also a great opportunity, since Ultimate Rewards points are worth just 1 cent each when redeemed for cash and just 1.25 cents each when redeemed for paid airfare. On the other hand, Ultimate Rewards points are potentially worth much more when transferred to Hyatt and redeemed for expensive stays. If it sounds like I've been wrestling with this problem for a while, it's because I have. But ultimately, I fall on the side of redeeming my Ultimate Rewards points for 1.5 cents each. That's because I'm points-rich and cash-poor: if I "saved" my points by redeeming 20,000 or 14,000 of them against the Air Berlin itinerary, instead of transferring in 16,000 Ultimate Rewards points, I would then redeem the corresponding Ultimate Rewards points for cash at just one cent each. In the business, that's what we call "false economy." On the other hand, if you live in a city that's served by American Airlines — and they actually offer SAAver seat availability — you might be used to redeeming your Avios for astronomical sums and leap at the opportunity to buy them for just 1.3 cents each. Similarly, if you value your Ultimate Rewards points highly because you're able to aggressively redeem them for super-high-value redemptions, the idea of transferring them to Avios in order to redeem them at 1.5 cents each should sound preposterous. I'm one of the most vigorous enemies of earning points speculatively. But once you've earned them, speculatively or otherwise, it's even worse to speculatively forego redeeming them! They're sitting in your accounts, begging to save you money. I'm going to do them a favor and let them. There have been two big, fun developments in the world of travel hacking in the past two weeks: Staples began selling $300 Visa gift cards online, and Office Max began selling variable-load Visa gift cards in-store. Those developments have been more than adequately covered elsewhere (see, e.g., $300 Visa gift cards, Office Max variable-load cards). The fun part, of course, comes not from earning your miles and points, but from redeeming them. On the one hand, both of these new developments are profitable on a cash-back basis. A brand new Chase Ink+ card would allow you to annually manufacture $2,500 in cash back at a cost of $589.05 (98 variable-load cards, assuming Office Max quickly fixes the current pricing error and raises the cost of each card from $3.95 to the correct $5.95). If you master high-value Ultimate Rewards redemptions, you can get astronomical value at minimal cost: a $12,001 Lufthansa first class flight for $259.18 in fees, or something like a 97.8% discount. So it's now easier and faster than ever to accumulate huge numbers of valuable Ultimate Rewards points. But Matt at Saverocity's post yesterday got me thinking about the fact that earning points more easily makes them no easier to redeem. Naturally you can redeem your cheap Ultimate Rewards points for cash, but many travel hackers find that unsatisfying when they know how to both earn and redeem points for much more valuable redemptions. While Matt introduces the idea of "outsourcing" to describe finding additional time to travel by automating and having others perform routine tasks, there's another way outsourcing can benefit you: outsource your travel, by giving it away. We give away travel all the time without thinking anything of it. If you have a partner, spouse, or children, you might be booking travel for 2 or 5 or 10 people, all of which is paid for with your own travel hacking expertise. We may not think of that as giving away travel because it's basically selfish: we want our loved ones with us while we travel! At the other extreme of altruism are the variety of programs that airlines participate in, which allow you to donate, typically without receiving any tax advantage, miles and points you already have in your frequent flyer accounts (United, American, Delta). Those programs may be noble, and I don't doubt that the charities involved receive some cash or travel benefit when they receive a mileage donation, they also don't allow you to exercise your specialized knowledge as a travel hacker: knowing which redemptions provide the best value for your redeemed mile. Somewhere in the middle is giving away travel to people you know, but just for the sake of letting them travel. If your niece is graduating from high school, you can outdo all the other uncles by sending her on an international romp for trivial out-of-pocket cost. When you've got a huge store of cheap Ultimate Rewards points, there are a few combinations that produce terrific vacations for trivial amounts of money. You may not want to take them yourself, but your relatives, young, old, or in between, might be thrilled to. The big three transatlantic options with minimal fees and fuel surcharges are Boston-Dublin on Aer Lingus (25,000 Avios round trip), Berlin-New York JFK on Air Berlin (40,000 Avios roundtrip), and Madrid-JFK/Chicago O'Hare/BOS/ (34,000 Avios roundtrip). 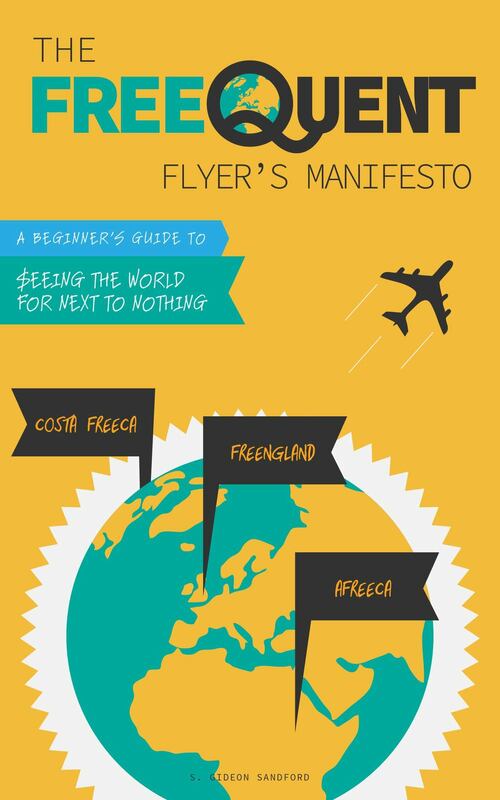 In case it needs to be said, Madrid, Dublin, and Berlin are all pretty amazing places to visit for the first time! Since American Airlines is an Avios partner airline and has a terrific route network in Latin America, you'll also find great deals there when dispatching your relatives from Miami. Nassau in the Bahamas, Cancun in Mexico, Montego Bay and Kingston in Jamaica, and Providenciales in Turk and Caicos are all 9,000 Avios roundtrips from Miami. From the West Coast, you'll probably want to send your loved ones to Hawaii for 25,000 Avios roundtrip from Seattle, Portland, the Bay Area, or Los Angeles and San Diego. So now we've isolated some of the destinations our loved ones might like to visit. How can we put them up? Of the Ultimate Rewards hotel transfer partners, Hyatt Gold Passport is going to be our best bet, with IHG Rewards Club as a backup option (more on that in a moment). Let's narrow down our destinations by access to low-level Hyatt properties. Berlin. Grand Hyatt Berlin, 15,000 HGP points per night. Nassau. Grand Hyatt at Baha Mar (opening indefinitely delayed). Jamaica. Hyatt Ziva Rose Hall and Hyatt Zilara Rose Hall, 25,000 HGP points per night. Cancun. Hyatt Zilara Cancun, 25,000 HGP points per night. Hyatt Playa del Carmen, 20,000 HGP points per night. Hawaii. Andaz Maui at Wailea Resort, 25,000 HGP points per night. Hyatt Regency Waikiki Beach Resort and Spa, 20,000 HGP points per night. Hyatt Regency Maui Resort and Spa, 20,000 HGP points per night. Hyatt Place Waikiki Beach, 12,000 HGP points per night. IHG Rewards requires a special mention because of their random PointsBreaks list of properties that cost just 5,000 points per night. While IHG is a transfer partner of Chase Ultimate Rewards, it's essential to remember that you never have to transfer all the points required to book a PointsBreaks property! That's because you only have to have 5,000 IHG Rewards points in your account to be able to purchase an unlimited number of additional points at 0.7 cents each to top up an award redemption. If, like me, you're always eyeing the PointsBreaks list for countries you might like to visit and stay on the cheap for days or weeks, remember: you don't have to go yourself! There might be somebody in your life who'd like to visit the Holiday Inn Mundanjiang even more than you! Like a lot of people who started traveling early and often, I cut my teeth on discounted airlines and youth hostels. One of the most remarkable things about travel hacking is that it gives us and our loved ones the opportunity to see the world in more comfort and at far lower cost than was possible just 5 or 10 years ago. So if you're having trouble redeeming points fast enough to drain down your rewards balances, don't forget that you can give travel away! Alaska Airlines has announced a promotion, whereby one-way economy awards between select city pairs on Alaska metal cost between 5,000 and 12,500 Mileage Plan miles, a 60% discount on some routes. Of course, to qualify seats have to be available at the lowest level of award availability, and that means they're also bookable using British Airways' distance-based Avios award chart. So I thought it would be fun to compare the standard cost in Avios and the promotional cost in Alaska Airlines Mileage Plan miles. Alaska Airlines miles are very valuable when redeemed for partner awards (100,000 miles and trivial taxes and fees for Emirates A380 First Class to Asia, for example) and for last-seat availability, for example to Hawaii during the Christmas holiday season or when you just need to be somewhere and are miles-rich but cash-poor (I know the feeling!). At the same time, they're relatively difficult to earn except through transfers from Starwood Preferred Guest, clicking through their online shopping portal, or crediting revenue flights on Delta, American, or Alaska to the Mileage Plan program. That's why under most circumstances it would be preferable to redeem easily-acquired British Airways Avios for Alaska Airlines award flights, rather than Alaska's own, more valuable, Mileage Plan miles. Of these city pairs, can you guess how many are more than 650 miles, the cutoff for British Airways 4,500 Avios one-way awards? If you said 3, you'd be exactly right: the 3 Bay Area airports (SFO, OAK, and SJC) clock in at just under 700 miles to Seattle, putting those flights in the 7,500 Avios price band. What do you think? How do these discounts compare to a 7,500 Avios redemption, available year-round? If you said they weren't any kind of discount at all, you'd only be 66% correct. That's because flights between Boise and the 3 Bay Area airports in fact cost just 4,500 Avios, clocking in at between 511 and 523 miles! I'll spare you the rest of the promotional city pairs (at the 10,000 and 12,500 Mileage Plan mile levels) and end with two thoughts. First: there's nothing wrong with promotions like this. For folks who (rightly!) credit their revenue Delta and American Airlines tickets to Alaska's Mileage Plan, the ability to redeem those miles for short flights around the Western United States at a steep discount is a terrific opportunity, and I'm sure this promotion will be incredibly popular. The least valuable mile is the one you don't redeem, and if this promotion gets folks to redeem their miles for trips they want to take, it'll be an unqualified success. Second: while this example involves small stakes – just a few thousand miles here or there – a rough background knowledge of airline partnerships like this will keep you from making shockingly expensive mistakes. The classic example is the couple who allegedly redeemed 2 million Starpoints for SPG Flights revenue First Class tickets to Australia on American Airlines — when they could have transferred just a few hundred thousand points to American and redeemed them for an AAnytime award!